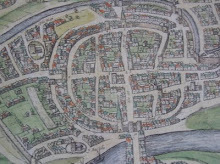 Walled Towns Research: What do Coventry, Hull, Kings Lynn and Nottingham have in common? What do Coventry, Hull, Kings Lynn and Nottingham have in common? They all had medieval walled town centres with extant traces AND now each has HISTORIC ENGLAND HERITAGE ACTION ZONE funding. Application for new funding and advice is open with a 9th August deadline. This initiative seems tailor-made for every English Walled Town and Town or City with a once walled centre. and I'm sure some I may have missed.